Star Building Systems was founded in 1927 and is a manufacturer of custom metal building systems with a reputation for performance and quality. Star products are the result of product development and engineering innovations that are proven in more than 300,000 Star buildings worldwide. From strong structural framing systems to walls, roofs and compatible accessories, Star offers beautiful solutions to your athletic, fitness and recreational building needs. Creative Tent International designs, manufactures, sells and installs engineered portable structures and tents with service worldwide. Quik-Span®, Fastrack®, Shasta Peak®, Shasta Shelter® in clear span widths from 20 feet to 130 feet. Easy installation on concrete, asphalt, grass or dirt. Flexibility in product configuration for sports pavilions, stadiums, ice rinks, tennis courts, swimming pools, golf tournaments, field house, gymnasiums, equipment storage, arenas. Where cool green meets lofty blue, use an EcoRoof on your next pavilion, shelter, gazebo or kiosk. EcoRoofs help keep water clean, improve air quality and provide wildlife habitat for birds and butterflies. EcoRoof is made of layers, including waterproofing material, lightweight soil mix and plants. The only maintenance required is occasional gardening, and it will last longer than a conventional roof. Natural Structures pavilions are clear span and feature fully enclosed roof systems that are bird- and bee-proof. Pacific Yurts are freestanding, easy-to-install structures that provide year-round comfort and a unique, memorable experience. Founded in 1978, Pacific Yurts is the original designer and manufacturer of modern yurts, used as cozy accommodations that generate revenue in public and private parks, campgrounds and resorts. Thousands of customers around the world rely on Pacific Yurts' service and proven product performance. The flexibility of yurts allows them to work as simple cabins, fully furnished luxury retreats or meeting rooms in all climate conditions. Vixen Hill has developed an extraordinary selection of pre-engineered cedar products. Modular gazebos, custom-size pergolas with barrel or arbor roofs, screened garden houses, shutters and porch systems designed for simple one-day installation. Since 1977, the Colorado Yurt Company has crafted the highest quality yurts, tipis and tents. Their handcrafted, unique structures are professionally engineered to meet International Building Codes. Their products can be found in state parks, summer camps and resorts around the world. They custom-make each structure to your specifications and to your satisfaction in their Montrose, Colo. facility. Par-Kut is a manufacturer of custom and standard prefabricated portable steel buildings. 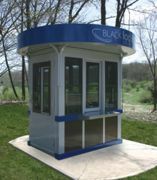 Built to specifications, uses include: guardhouses, pay-on-foot station enclosures and shelters, booths (ticket, parking cashier, inspection, toll, information), valet buildings, shelters (passenger, bus, shuttle, smoking and attendant), in-plant offices, equipment sheds, canopies, etc. Par-Kut buildings are delivered completely assembled via flatbed truck. Many options are available for blending buildings in with their surroundings. Bullet-resistant construction, built-in restrooms and modular aluminum structures. In addition to providing standard Shade ‘N Net structures for playgrounds, basketball courts, skateparks, bleachers and aquatic centers, Shade ‘N Net also provides a large variety of attractive custom shade systems to enhance all recreation areas. This is one of their "Stingray" structures, which is featured throughout the Heritage Bark Park in Henderson, Nev. Shade ‘N Net's motto is "Sun / UV Protection doesn't have to be boring anymore."